What is the uncertain future of self-driving car insurance? Autonomous vehicles bring fear. As their job prospects are being threatened, taxi and truck drivers are feeling anxious to brace themselves for the disruption. For car and truck insurers, the argument usually goes like this: automation will make vehicles so much safer, to the point where no accident will happen hence no insurance is required. This concern is ill-founded and this article serves as an illustration. More broadly, this article endeavours to present insurance-related challenges brought by autonomous vehicles to insurers and vehicle manufacturers and attempts to find solutions for these challenges. Challenges will be discussed under the organisations to which they apply, immediately followed by solutions. It is imperative to note that as of the writing of this article, we are still in the early stage of the development of autonomous vehicles, with no fully-autonomous vehicles commercially available to ordinary consumers. Right now, we have autonomous buses running on confined sites such as university campus or sport parks, but this application is hardly sophisticated enough to contribute meaningfully to the issues at hand. Currently, the most commercially successful partially-autonomous cars are developed by Tesla, but even its Autopilot system requires human intervention under many circumstances and establishing liability at an accident is still difficult for the courts. Some authors like to decompose the development of autonomous vehicles into stages or phases as an attempt to facilitate understanding. There are only three crucial stages for insurance purposes: minimally-autonomous (cars in 2018), partially-autonomous (if everyone has a Tesla in 2018) and fully-autonomous. The first phase, minimally-autonomous, will not be a topic of discussion in this article since insurance for this type of vehicle has existed for over 100 years and has remained unchanged for the most part. The second and third phases are the main focuses of this article. Each phase has its unique challenges, but we will see shared challenges as well. Let us now define the phases. The year 2018 is in the minimally-autonomous phase. Here most cars may have cruise control (automatic control of speed) and automatic braking, but this is as far as automation goes. Fully-autonomous is self-explanatory. This is when most people use cars that do not require a driver at all, with the car driving itself under all circumstances at all times. The definition of partially-autonomous is not as definitive, because this includes everything between minimally- and fully-autonomous. The best example is if everyone was driving a Tesla in 2018. These cars can autonomously drive themselves under certain circumstances (such as highways), but they still require a driver’s active attention to the surroundings and expect drivers to take back control frequently. The most significant concern for car and truck insurers is that autonomous vehicles will hurt their revenue. The extreme version of this argument is that fully-autonomous vehicles will become so safe that society does not need vehicle insurance anymore. The elimination of the need for insurance is unlikely to occur because, despite humanity’s relentless effort, no engineering product is perfect and flawless. Even fully-autonomous vehicles will have issues that cause accidents, presenting risks that insurance can mitigate. There will, however, be a major change. In the world of fully-autonomous vehicles, liability for loss will shift from the consumer to the manufacturer of the vehicle. As we no longer have such thing as a driver, all driving responsibilities fall onto the vehicle’s software and hardware. When one is not responsible and is not in control of the vehicle’s operation, we cannot hold one accountable for losses. In other words, car insurance will transform into product liability insurance, and no individual consumer needs to take out car insurance. A more moderate version of the above concern is that automation will make vehicles safer, hence decreasing insurance premium. A reasonable argument, but we must not disregard the fact that claim cost for insurers will reduce at the same time. As we are still far from mass adoption of fully-autonomous vehicles, it is difficult to predict the proportionate decrease of claim cost. If claim cost decreases at a higher rate than that of the reduced premium, this may not be the end of the world. However, due to the unpredictability, insurers need to focus on things other than price to gain a competitive advantage. In-house knowledge of autonomous systems is a must, and insurers need to start developing this capability now. Underwriters need to understand how autonomous systems respond to different road and weather conditions, such as construction zones, road closures, and blizzard. They also need to have an appreciation for the diagnostics that manufacturers have to maintain the systems and how quickly updates are pushed out and executed. More now than ever, data is critical. When vehicles become more machine-driven, insurers have fewer excuses not to utilise data to the fullest extent. Most insurers already have some data analysis capability for actuary purposes, but they need to get prepared for the extra amount of data collected by ever more sensors on the vehicles. If we turn our eyes to another problem, we see a conundrum. On the one hand, we have evidence to show that automation does make vehicles safer. Even with Tesla’s partially-autonomous Autopilot system, we can see the clear result below. 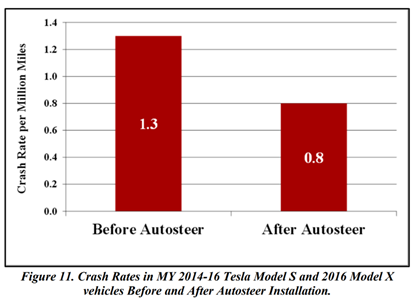 The crash rate per million miles has decreased significantly from 1.3 to 0.8 after Autosteer was installed. That is nearly a 40% reduction in crash rate. On the other hand, we can imagine that because all autonomous vehicles from one manufacturer will use the same hardware and software, if there is one fault in the vehicle, it will be the same fault for all vehicles. This has the potential to cause an enormous amount of vehicles to malfunction simultaneously and result in a significant claim -just imagine a hacker gains access to millions of vehicles at the same time! What this means is the nature of car insurance will be transformed from high frequency and low severity to low frequency and high severity. This change presents a huge risk profile for insurers. The solution will address the next problem as well, so let’s have a look at the next problem first. It was mentioned above that the insurance burden would shift from consumers to car manufacturers, but basic economics tells us this is a profound problem. The number of future manufacturers requiring product liability insurance will be significantly smaller than the number of today’s drivers needing car insurance. So when fully-autonomous vehicles become commonplace, the number of clients for coverage will be substantially lower than that of today’s, yet the number of insurance suppliers will remain the same (at least initially). Each insurance client will require insurance for many more vehicles, but the number of clients will decrease (basically to the total number of vehicle manufacturers), leading to manufacturers gaining tremendous market power. They will have more leverage in negotiating premium and coverage, and this will hurt insurers’ bottom line. What is more concerning, is that because the number of clients is so small, the market size is so small, that it does not have room for many insurers. Some insurers may see a forced exit out of the market. To avoid manufacturers having too much market power and to avoid having too much risk due to vehicles sharing the same build, insurers need the help of regulators and policymakers. We may be able to impose manufacturers to insure their vehicles with multiple insurers. For instance, an example distributed model could see 10% of a car model insured by A, 10% insured by B, and so on. Manufacturers can choose which insurers they want to work with, but within each model of car, they have to use different insurers, and all insurers provide cover for the same proportion of the model. Here are the merits of this solution. The purpose of insurance is that we take the premium from safe drivers, use this money to pay for accidents caused by unsafe drivers and then hope we have money left. This business model will not work if a manufacturer chooses one single insurer to insure all of their vehicles and the insurer cannot get more clients because of the small market size. Manufacturers will be inclined to do precisely this in a world of fully-autonomous vehicles because this saves premium, is easier to manage, and grants them more negotiating leverage. Insurers will try to fight this but will struggle to find clients due to the limited number of clients available; this is where the regulation comes in. The market power of manufacturers is reduced by requiring them to use multiple insurers. Competition amongst insurers is sustained by allowing manufacturers to choose insurers freely. The risk borne by insurers is reduced by requiring each car model be insured by different insurers, sharing the risk evenly. Things can get extremely tricky when we are in the partially-autonomous phase. Specifically, the determination of liability in the event of a car crash. Since partially-autonomous cars can drive themselves in some situations but require human control in others, the responsibility of an accident can take longer to be established, as we see with Tesla cars today. Ultimately, liability shall be determined by the courts on a case-by-case basis, but we can still try to minimise the resources and time needed by the courts. Just like aeroplanes, all autonomous vehicles, regardless of the level of automation, should have a ‘black box’ to record all data gathered by sensors onboard, ideally including conversations taking place in the car. Due to the sensitivity of privacy, regulators are unlikely to allow an in-car conversation to be recorded, but they can at least obligate that all vehicles must be installed with a black box that can sustain extensive impact and pressure. This black box will prove instrumental in the decision-making process of courts and jury, depicting a clear picture of what took place at the accident. We have already seen that, as vehicles become more autonomous, liability will shift from consumers to vehicle manufacturers. In turn, this means the burden of taking out insurance now lies with manufacturers. However, it is not rational for manufacturers to see this as a burden since insurance is meant to protect them. Besides, manufacturers have much to gain in this automation revolution, and the insurance premium is a price worth paying. When the vehicle hardware or software is deemed responsible for an accident, it is conceivable that the fault is not in the vehicle manufacturer, but its ‘downstream’ suppliers, vendors, or subcontractors (let’s call them partners). In the interest of protecting themselves, it is therefore essential for manufacturers to put in an insurance clause in their contracts with any partners. This insurance clause shall stipulate that the partner is obliged to obtain insurance and if the partner is found to be legally liable, subrogation will occur. The clause not only protects the manufacturer but also assists the manufacturer’s insurer in seeking recovery from the partner. Cyber liability exposures arise when vehicles are ever more reliant on computer systems and telecommunication. Hacking and digital virus are some of the most significant challenges faced by organisations and individuals today, and this problem will only become acute when what is vulnerable is as dangerous as cars. The possibility of hacking into a moving car was demonstrated in July 2015, with two American hackers remotely gaining control to, among other things, the engine of a driving Jeep while a journalist was driving it on a highway. The engine stopped in the middle of the highway while the car was moving, but fortunately, no one was hurt because the journalist asked the hackers to perform the attack. Now, imagine the hacker was, in fact, malicious, and you were sitting in the car. To prevent this, manufacturers need to ensure software on cars is always up-to-date. Requiring that manufacturers continually test for bugs, build an update as soon as a bug is discovered, and force update installation on cars as soon as an update is released. Manufacturers also need to prevent the consumers from tampering with the software. The software should not allow any alteration, and if it detects any attempt to alter, an alarm is raised with the manufacturer and the car should cease to operate when it is safe to do so. Perhaps the most delicate business for manufacturers in the world of partially-autonomous vehicles is to communicate to consumers that vehicles do require human intervention and to ensure consumers do actively intervene when necessary. Many consumers of autonomous vehicles currently give their vehicles more faith than the vehicles deserve, and this can cause accidents and unnecessary disputes. What manufacturers need to do to educate consumers before they purchase the vehicle thoroughly, and upon purchase, have the consumer sign a legal declaration stating they have understood the safety requirements and will comply fully. What can also be included in the declaration is a promise not to alter the vehicle software. It is likely that automation will reduce individual car ownership drastically and corporates will own large fleets of autonomous vehicles. All the conclusions detailed in this article apply to both individual car ownership and corporate ownership. Autonomous vehicles will bring immense benefits to human society. We will get safer roads, shorter commute time, better use of commute time, and reduction in carbon emission. These benefitswill, however, take decades to accomplish, but everyone has a role to play in accelerating this revolution. Insurers, manufacturers, and regulators all need to collaborate to enable the future. There will be obstacles to overcome, but our collective effort shall bring us one step closer to success.